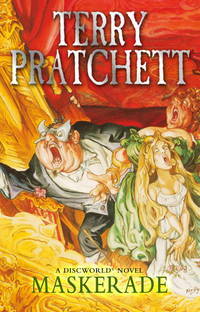 SIR TERRY PRATCHETT is one of the most popular authors writing today. He lives behind a keyboard in Wiltshire and says he 'doesn't want to get a life, because it feels as though he's trying to lead three already'. He was appointed OBE in 1998. His first Discworld novel for children, The Amazing Maurice and His Educated Rodents , was awarded the 2001 Carnegie Medal. Maskerade is the eighteenth novel in his phenomenally successful Discworld. Corgi. PAPERBACK. 0552167568 Item in good condition. Textbooks may not include supplemental items i.e. CDs, access codes etc... . Good. Paperback. New. This is the Opera House, Ankh-Morpork...a huge, rambling building, where innocent young sopranos are lured to their destiny by a strangely-familiar evil mastermind in a mask and evening dress, with a penchant for lurking in shadows, occasional murder, and sending little notes full of maniacal laughter and exclamation marks. Corgi. PAPERBACK. 0552167568 Brand New ,Original Book , Direct from Source , Express 5-8 Business days worldwide Delivery. . New. Corgi. Paperback. 0552167568 Please allow 4 - 14 business days for Standard shipping, within the US. Thank you for supporting our small, family-owned business! . Fair. 2013-07-01. Corgi. Paperback. 0552167568 Please allow 4 - 14 business days for Standard shipping, within the US. Thank you for supporting our small, family-owned business! . New. 2013-07-01. Corgi. Paperback. 0552167568 Please allow 4 - 14 business days for Standard shipping, within the US. Thank you for supporting our small, family-owned business! . Fine. 2013-07-01.